In the uninspired Superman: Unbound, Superman (capably voiced by Matthew Bomer) and Supergirl (Molly C. Qunn filling in nicely for Summer Glau) battle Brainiac (John Noble) to save both Metropolis and the Kryptonian Bottle City of Kandor from Brainiac's grasp. Adapted from the popular Geoff Johns penned/Gary Frank drawn "Superman: Brainiac" comic books, Unbound eschews the best part of the comics: Frank's glorious illustrations where he takes great pains to have Superman resemble Christopher Reeve. Unbound's animation is unremarkable. Unbound's Supergirl and the Brainiac Skull Ship are the most visually pleasing design-wise, while Lois Lane's eye-shadowed, dragon lady look is a puzzler. This Superman tale doesn't seem to be tethered to any previous comic book or DC Animation continuity. Lois is aware that Clark Kent is Superman and they are dating but unmarried. Their rather shrill conversations, mostly held in the Daily Planet newsroom presumably within earshot of anyone looking for a scoop, revolve around Clark's insistence on keeping Lois safe from all forms of harm, including other guys hitting on her. "It's like I'm dating my own stalker," Lois grumbles, in an amusing nod to the creepier aspects of Superman Returns. Meanwhile, Supergirl's characterization is consistent with the Supergirl seen in the far more enjoyable Superman & Batman: Apocalypse, though she bounces from surly teen to heroic underdog to emotional wreck at a drop of a hat. But Supergirl is dead on about Brainiac: he sure does talk a lot. Unbound is a curious hodgepodge of 1950's Superman concepts mixed in with some 1970's era Superman anachronisms like skeevy Daily Planet sports reporter Steve Lombard hitting on Lois Lane. Superman visits alien worlds and the bottled city of Kandor; the denizens of which are depicted in full 50's era sci-fi glory: matching headbands, mini skirts on men, gloves and booties. 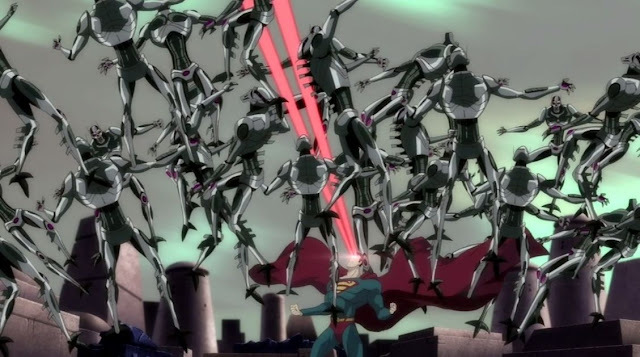 Superman hardly uses his Super-brain against Brainiac, rushing headlong and preferring to punch and heat vision his way out of trouble until the end, when he forces Brainiac into a swamp and defeats him with the sensory overload of the living planet Earth - a satisfyingly 50's-style sci-fi resolution. Supergirl in her own right mounts a one-girl crusade against Somali warlords and North Korean human traffickers that seems out of place with the science fiction bent of the main story. But nothing is as bizarre as the sight of tiny Lois Lane staring at a giant Brainiac from within the Bottled City of Metropolis and flipping him double middle fingers.